If you want to see art up close and personal, organize and hang a group show. If you want to make yourself feel important, start calling yourself a curator. 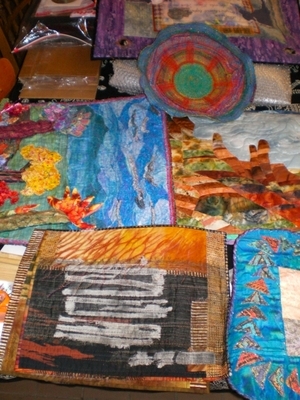 I coordinate the exhibits for Kansas Art Quilters, which has turned out to be a group of very talented textile artists- many of whom do not live in Kansas. But I do, and maybe that is enough. Our next exhibit to open will be "Kansas Art Quilters: Altered Views" at the Irene B. French Art Gallery in Merriam, Kansas. I consider Merriam to be an inner-city suburb in the greater Kansas City area. The gallery's website doesn't seem to have photos up yet of the exhibit, even though I sent them in by the deadline earlier this month. (But it does still have photos of the show I had there last September with a photographer.) The slow addition to the website of the KAQ exhibit is the kind of thing that a curator gets blamed for that is really out of her/my control. But that is part of the job, as is obsessing about details like how to pack an exhibit to travel. I always start out thinking I'll get each piece packed in a consistent and well labeled manner. But as the chore rolls along, I generally begin to make exceptions, and no one packing container works for everything. And there is that procrastination problem I have, so sometimes I run out of time. Sometimes I am helped with this by late arriving artwork. This time, my printer stopped working, so the packing labels had to be hand written and, hopefully, temporary. But just look at the great stuff I got to see! And here is how it looked as it headed to the car. Luckily, I was hand delivering the exhibit to this first gallery, so the boxes didn't need to seal up. I'll have to fix that later in this exhibit's two years on the road. Linda, Oh how time flies when I'm on your site. I just clicked on the Link to Merriam Arts Council GAllery Show and WOW. 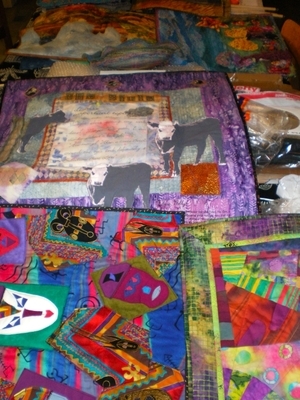 I had no idea these quilts sold for so much. Such beautiful, stunning works, I shouldn't be surprised. Thank you for educating me and inspiring me.